March 1, 2017 March 1, 2017 Dan O.
Victor (Pruitt Taylor Vince) works in a pizza shop and doesn’t really talk to anyone around him. While he gets along with most everyone, it has to do with the fact that he’s so shy and big, nobody really knows how to really talk to him, or what to say. Because for Victor, life is just something to get through on a day-to-day basis and it doesn’t really matter about much of anything else. 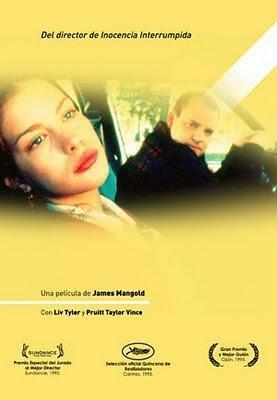 But his life sort of changes when a new girl, Callie (Liv Tyler), comes into town and begins working at one of the local taverns in the area. Immediately, Callie takes a bit of a liking to Victor – it may not be love, infatuation, or anything sentimental, but it’s enough to give Victor some life and hope. But Callie has some issues going on in her own life, in that she doesn’t really know what she wants to do, either. The two end up forging something of a friendship that helps the two navigate through life and realize that there truly is some sweetness out there in the sometimes dark and brim world. Writer/director James Mangold has had quite the career, mostly because he’s never really seemed to pin himself to one genre in particular. When he’s not making action-heavy, big-budget spectacles (the Wolverine, Knight & Day), he’s actually out there making subtle, slightly arty dramas (Girl, Interrupted, Walk the Line). And of course, when he’s not making those movies, he’s off trying his hand at other genres, like Westerns (3:10 to Yuma), fantasy rom-coms (Kate & Leopold), and twisty, Hitchcockian-thrillers (Identity). And then, there’s his debut, which is perhaps his most different movie, but unfortunately, probably his weakest. For one, it shows that Mangold definitely knew how to create a sense of time and place. Heavy is a very sad, depressed and at times, moody flick. Mangold puts us in this small town, where it’s not exactly bright, shiny, or even happy – it’s just a lot of rain, clouds and frowns. There’s hardly any light in the sky, nor is there much of any light in the people’s faces. In a way, they’re all kind of miserable and at a stand-still, not knowing where they want to go, what they want to do, and how to go about the rest of their lives. Which is fine for a mood-piece, if that is exactly what you’re going for, but at nearly two hours, Heavy wears out its sad and repressed welcome. After all, Mangold presents this small part of the world and doesn’t have much else to offer; the sweeping shots of the forest and mountains underneath dark clouds of rain, while beautiful, are also incredibly repetitive, not adding much to the story except an obvious bit of symbolism. Which isn’t to say that it’s a pretty movie, because it is, but beautiful landscapes can only go so far. Especially when you don’t have much of a story to actually work with. And that seems to be what’s happened with Heavy. Mangold has a good idea of how to frame and show a story, but actually telling it and allowing for there to be any sort of drive behind the narrative, he doesn’t quite seem to have the knowledge of here. Cause if anything, Heavy isn’t just a heavy movie, but it’s a slow one, that doesn’t really seem to have much to say, or anything to really show. It’s just a bunch of sad people, being sad and trying their hardest not to be sad anymore. Or something like that, I’m not quite sure. It’s basically the most picture perfect Sundance movie ever made: Moody, dark, gritty, and basically just depressed. It doesn’t have much of a reason to be, either, but Mangold clearly doesn’t know that and pounds hard on the darkness. Cheer up, Liv! You’re always going to be rich! If anything, the performances do help this movie out a whole bunch, even when it seems like there’s no real character-development or strong writing to even help them. Case in point, Pruitt Taylor Vince as Victor. Vince is a pretty accomplished character actor, who shows up every now and then in those sloppy, country bumpkin-ish roles. Here though, he’s actually pretty thoughtful and rather sweet as Victor, never going too far to say much of anything, but always getting something across by just the look on his face, or the slight-movement of his brow. It’s actually the perfect kind of small, subtle performance, for this small, rather subtle movie, the only problem is that the rest of the movie doesn’t quite know what to do with itself, so of course, it’s a great performance put to waste. Same goes for Liv Tyler as the object of Victor’s affection. At this stage early on in her career, Tyler was more of a cute mystery – we didn’t quite know if we could trust the characters she portrayed, nor did it seem like she did. And here, she’s quite good in a role that doesn’t quite measure up to much, except being pretty, moody, and nice to almost everyone around her. Pros of the big-screen like Shelley Winters, who plays Victor’s sometimes controlling mother, and Debbie Harry, as the co-worker who’s a bit of a problem to everyone, work out well here, but they, too, like the rest of the movie, just seem underdeveloped. Oh well. At least Mangold would eventually get his act together. Consensus: Even with the beautiful cinematography, Heavy just never fully comes together as both a visually and emotionally satisfying movie, but instead, only resulting in the former. Kiss her, bro. Do it. Why not?